A new snack food has Popped onto the Boulder scene. It’s healthy enough for the most selective eaters; it’s organic, gluten free, Non-GMO and contains only a few basic ingredients (one ingredient is purified butter so it is not Vegan), and it’s created from a plant which symbolizes purity and beauty in both Buddhism and Hinduism. I had the opportunity to get my hands on a few free samples of this new treat and was able to share it with friends who were all intrigued by the popped seeds that no one had seen or heard of before. So what exactly is Popped Lotus, you wonder? Popped Lotus Seeds are created with simple ingredients. Made with purified butter and spices this simple sweet and savory snack is a flavor explosion like no other. 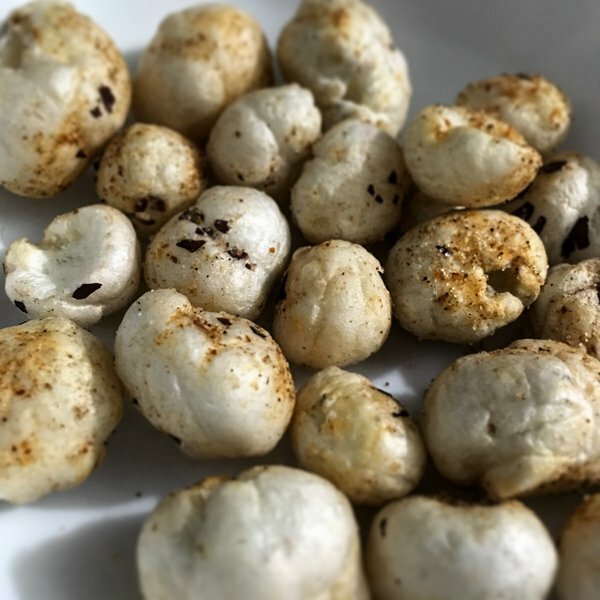 Sharma said Phool Makhana aka Lotus seeds are commonly eaten in India, where he grew up, and his first introduction to the seeds was eating a version prepared by his mother, and added this product is his own creation. I left a few samples on my kitchen counter and let guests sample at will, and like chickens to feed, the grazing began. At first I wasn’t sure what I was eating, but as a friend mentioned the texture was similar to puffed corn, or “Pirate’s Booty”, and suddenly my brain and taste buds connected it all together. Like the popular snack, Popped Lotus’ texture is light and airy, yet dense with nutrients. The two flavors we sampled were Sea Salt and Spicy Mango, and both were accurate descriptions of the flavors. As promised, we weren’t left scraping and digging shells out of our teeth, as common in popcorn, and our bellies weren’t full of chemicals or fat – Popped Lotus boasts a whopping 2 grams of protein per 1 ounce bag, with about 70 to 90 calories and only 1 gram of saturated fat. I would recommend this to anyone who wants to indulge in a more health conscious way, or for those health food junkies who can’t wait to try anything new. It’s also husband-approved and toddler-approved – depending on current mood, of course. We will definitely be keeping our eye on this new Boulder food company. Popped Lotus is now on sale at all Alfalfa’s Markets in Boulder County. Follow Popped Lotus on Twitter at @PoppedLotus.